Caitlin Doughty: What's Wrong With The Way We Bury The Dead? Caitlin Doughty on the TED stage. Mortician Caitlin Doughty is trying to find a more natural and sustainable way to bury our loved ones. But to get there, she says: we need to rethink how we view death altogether. 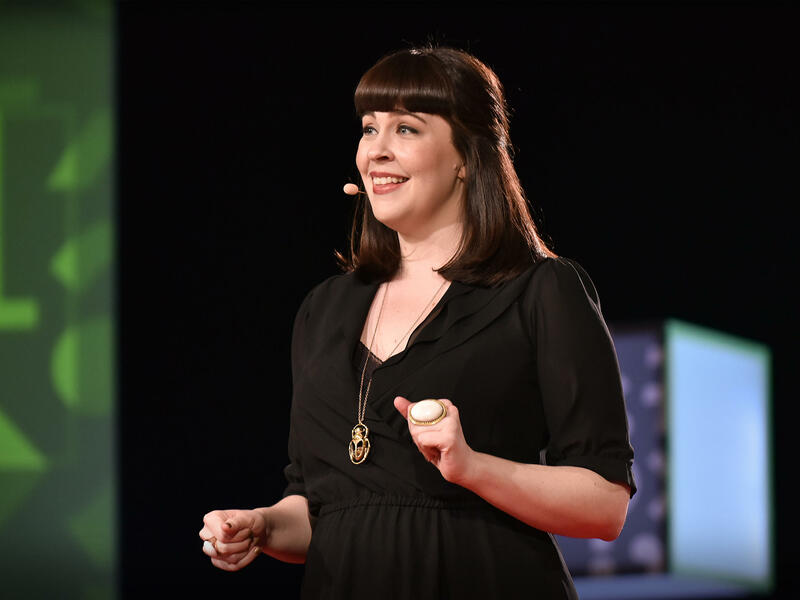 Caitlin Doughty is a mortician and the founder of The Order of The Good Death, a group of funeral industry professionals, academics and artists exploring ways to better prepare for the end. In 2015, Caitlin became unhappy with the state offerings of the American funeral industry and founded an alternative funeral home, Undertaking LA, to help people bury loved ones in a more sustainable way. Caitlin is also the author of Smoke Gets in Your Eyes and From Here to Eternity. It's the TED Radio Hour from NPR. I'm Guy Raz. And on the show today, ideas about dying well, grief and even how we take care of the dead. CAITLIN DOUGHTY: I would be in the crematory about to cremate a body and realize that it was me and this person alone in this industrial warehouse. RAZ: This is Caitlin Doughty. She's a mortician. DOUGHTY: Why was it me? I was some random 25-year-old girl. Why was I the one alone with your father doing this procedure, sending him into the sacred flame for his final moment on earth? Why was that just me, and why was it in this warehouse? And how did we get to this place? I knew the history, so I knew that people used to take care of their dead from start to finish, from dying process to disposition, burial or cremation. And here we are in the 21st century, and it had become efficient. Sure, but where is the humanity in that? RAZ: Did people used to have a healthier attitude about death, like, a long time ago? DOUGHTY: I would say absolutely. Yeah. I mean, you know, I'm not really in the position to rank people on their (laughter) - or rank cultures or time periods on their levels of acceptance. But I will say even if you want to look at 150 years ago in America, when someone died, they died at home. The family took care of the body. They were prepared and waked in the home. Some neighbor built a wooden coffin, and the person was carried on the family's shoulders to be buried. And it was entirely interactive and entirely family-based. And in that 150-year time to where we are now, we've completely outsourced every part of the dying and death process. And of course it's going to affect our culture. It's going to affect how we see death and how comfortable we are with death. But I think people are starting to realize that maybe that's not the best system. RAZ: Caitlin Doughty picks up her idea from the TED stage. DOUGHTY: In America, our death traditions have come to be chemical embalming followed by burial at your local cemetery or, more recently, cremation. It's a multibillion-dollar industry, and its economic model is based on the principle of protection, sanitation and beautification of the corpse. Whether they mean to or not, the funeral industry promotes this idea of human exceptionalism. It doesn't matter what it takes, how much it costs, how bad it is for the environment. We're going to do it because humans are worth it. It ignores the fact that death can be in an emotionally messy and complex affair. And that there is beauty in decay, beauty in the natural return to the earth from whence we came. We'll start with a dead body. The funeral industry will protect your dead body by offering to sell your family a casket made of hardwood or metal with a rubber sealant. At the cemetery, on the day of burial, that casket will be lowered into a large concrete or metal vault. When you choose burial at the cemetery, your dead body is not coming anywhere near the dirt that surrounds it. Next, the industry will sanitize your body through embalming, the chemical preservation of the dead. Embalming is a cheat code providing the illusion that death and then decay are not the natural end for all organic life on this planet. Finally, the industry will beautify the corpse. They'll put it in makeup. They'll put it in a suit. They'll inject dyes so the person looks a little more alive, just resting. Now if this system of beautification, sanitation and protection doesn't appeal to you, you are not alone. There is a whole wave of people - funeral directors, designers, environmentalists - trying to come up with a more eco-friendly way of death. There's no question that our current methods of death are not particularly sustainable what with the waste of resources and our reliance on chemicals. DOUGHTY: Even cremation, which is usually considered the environmentally friendly option, uses per cremation the natural gas equivalent of a 500-mile car trip. RAZ: So it seems like, over several years of being in this industry, you've come to the conclusion that the way we handle bodies at least in the U.S. and in Western countries isn't just misguided, but it's not environmentally sustainable. DOUGHTY: ...Because that's what it was. They didn't have all these bells and whistles and protective devices we have now. So a natural burial is simply a hole that's actually much shallower than in a conventional cemetery because all of the good decaying mechanisms are in that topsoil. And then you're in just a simple cotton shroud, or you can have a casket that's very decomposable, like a wicker casket, for instance, or a seagrass casket. And you go underneath the ground. And sometimes you can have a headstone. Sometimes not, but it's really just - it couldn't be any more simple. RAZ: It seems like what you're talking about isn't just a - you know, isn't just a method of being buried. But it's about something bigger, right? That it's almost like a philosophical outlook, that we're just - you know, we're just another animal. We're going to die. And, like, there's a cycle here, and we might as well be part of that cycle. Like, we might as well become food for other creatures and nutrients. DOUGHTY: ...That cemeteries used to be. RAZ: So instead of these, like, manicured lawn-type cemeteries, you would just kind of find a natural area. And as people get buried there naturally, it becomes kind of, you know, protected conservation land. DOUGHTY: There's hope in conservation cemeteries. They offer dedicated green space in both urban and rural areas. They offer a chance to reintroduce native plants and animals to a region. They offer public trails, places for spiritual practice, places for classes and events, places where nature and mourning meet. Most importantly, they offer us, once again, a chance to just decompose in a hole in the ground. The soil, let me tell you, has missed us. RAZ: So Caitlin, you actually do some of these conservation burials outside of LA in Joshua Tree, right? DOUGHTY: Yeah. And I've stood there as someone buried their mother. And they just hand-fill the grave, and the person just disappears into the desert. And you can see them working out their grief as they are shoveling the dirt. RAZ: So it's almost like there's a connection between a natural or conservation burial and making death less painful. DOUGHTY: I think it's almost kind of a metaphor. The body's under there decomposing, and it's messy and it's wild as your grief is and as it should be. It's supposed to be messy and wild and difficult and a journey. You're not supposed to trap your emotions in a box underground and don't let anything touch it. You're supposed to feel your feelings because that's the only way through death. And I think accepting that that's what's going to happen to your body also helps you accept that that's what's going to happen in your mind and your grief process. DOUGHTY: People are so afraid to be interested in death. They don't want to seem morbid, but death is the natural end to every single person's life. If you're not going to be interested in death - if that's not the universal experience, what is? RAZ: Caitlin Doughty, she's a mortician in LA where she runs her nonprofit funeral home, Undertaking LA. You can see her full talk at ted.com. Transcript provided by NPR, Copyright NPR.